It's the Holy Grail of self-loathing DualShock gamers. Ditch Sony's controller for Microsoft's with the XCM's latest, fully functional Cross Battle Adapter. 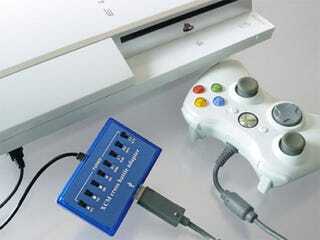 The adapter plugs into your PS3's USB port where it accepts wired Xbox 360 controllers. Beyond mere "it works!" functionality along with new rumble support, you can also toggle turbo on any button—which is why the unit has like a thousand switches.